This deal combines the BOOK and DVD deal. 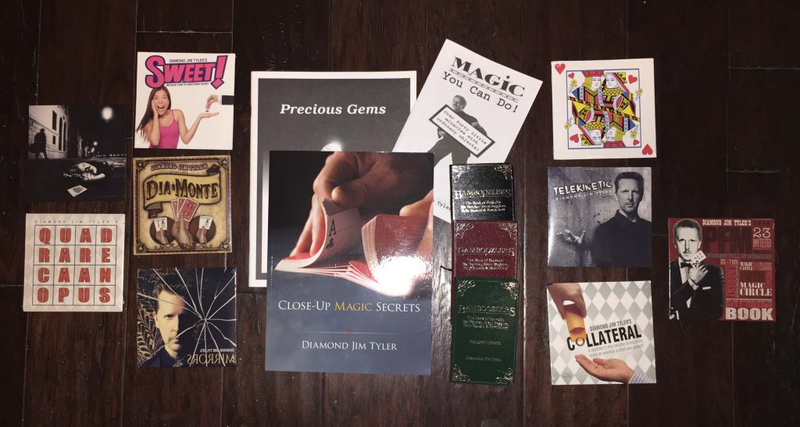 That is 6 books (Bamboozlers 1-3, Close-Up Magic Secrets, Precious Gems & Magic You Can Do). The highly acclaimed ebook Card Magic USA. 9 DVDS (Collateral, Sweet, DiaMonte, Mirrors, Pockets Full of Miracles, Quadrare Caan Opus, The Squeezer, Diamond Jack, and Telekinetic). This special is valued at $400.00. So that’s $240 off!! SHIPPING IN THE U.S. IS ONLY $5. However International Shipping is $50 and up, due to the USPS postal rate increase and the weight of the books. International orders will pay $15 initially during checkout and billed the difference afterward.